Popular activities include watersports on Topaz Lake, fishing on Topaz Lake, horseback riding, hiking, birdwatching, cycling on back roads and ATV riding. 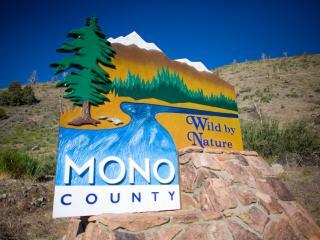 The most northern town in Mono County, Topaz provides services for visitors to Topaz Lake. Known for it&apos;s prize-winning trout, nine-month fishing season, and water sports, Topaz Lake is a recreation paradise. Visitors can also try their luck at the casino, located just over the Nevada border overlooking the lake. cash and prizes. Great way to start the new year! A full service marina offers boat rentals, fishing gear and shoreline camping for those who like to brave the icy chill of winter fishing. Success is sweet with trophy size trout on the other end of the line! Fish Jan. 1 – Sept. 30 (permits are required). Topaz is easy to find on Highway 395. It is at the border of California and Nevada between Bridgeport, California and Carson City, Nevada. It’s roughly halfway between Lake Tahoe (70 minutes) and Mammoth Lakes (80 minutes). Relatively mild winters make the Antelope Valley a natural stopping off point for wildlife; home to one of California&apos;s largest herds of mule deer. In late September and early October the Walker River Canyon and Monitor Pass landscape (Hwy. 89) are sights to behold with lively golden, orange and red fall colors. Topaz Lodge Resort & Casino offers games, dining, an RV resort and hotel rooms.